Jennifer Del Giudice and Stefanie Schodrof are on a mission. Together, they are on a crusade to educate people on the toxins in products and in life that are causing stress, unhappiness, or illness. 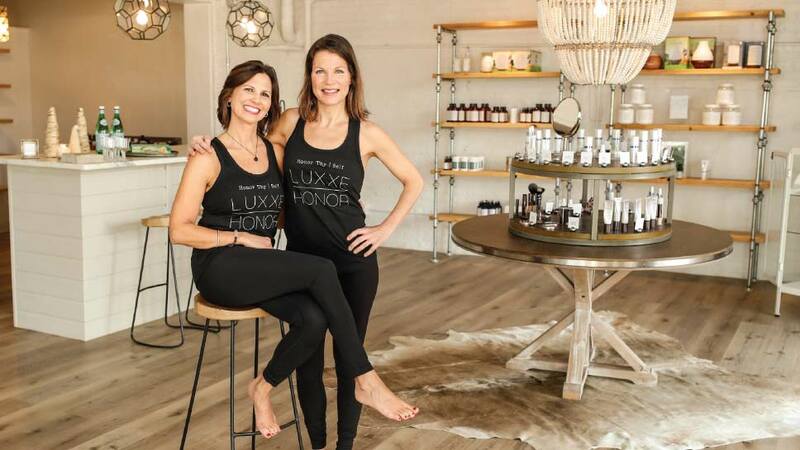 They are doing so with Luxxe | Honor, a new wellness company and studio in La Grange. While they came from different backgrounds, Del Giudice and Schodrof both gravitated to this mission, and the concept for the wellness studio evolved over the past few years. It officially opened last month, with a grand opening event on February 9. Luxxe | Honor is a retail store with 100 toxin-free products for sale, many of which are the company’s own brands. “A lot of people know about the dangers in some foods, but people really do not understand the chemicals in every day products and how sick they are making us,” Del Giudice says. The name Luxxe | Honor might seem familiar, because it is an evolution from Luxxe Organix, previously in Hinsdale. Del Giudice owned the company, which offered skin care, body care, aromatherapy, and meditation. Schodrof brought her business background to the conversation, and together they created this new concept studio, which now has 40 collaborators and practitioners who will be working there and providing services with Luxxe | Honor. Among its many natural products, Luxxe |Honor features its signature and highly acclaimed Honor Thy Deodorant, which is also available wholesale and on Amazon. It is 100 percent natural, and free of aluminum, synthetics, and preservatives that have been proven to cause serious health risks. You can visit the aroma bar in the studio anytime to learn more about the products, and the oils and ingredients used to make them. In addition to retail, the studio also offers services in four different areas of physical and mental health: Mind + Care, Face + Care, Body + Care, and Coach + Care. You can take mindful breathing and movement classes in the 26-person studio, get natural facials, learn about the company’s Osmosis safe skincare products, sign up for massage therapy or Reiki healing appointments, and explore coaching opportunities for women’s health, diet, and more. “We believe in self-care, and we want to get away from the idea that a facial or massage is looked at as a luxury,” Del Giudice says. Instead, they want to creative a welcoming environment where self-care becomes a part of a healthier, everyday routine. You can purchase a membership at Luxxe | Honor for only $85 a month, which allows you to get up to four different treatments each month—including one in body care or face care, one free workshop, and two mind-care classes (breath or strength)—plus 10 percent off products. And so what they envision is a place—this studio—where people can come, get educated, relax, de-stress, and make a decision to do something better today than they did yesterday.